There is a place, like no place on earth. A land full of wonder, mystery and danger! At 12:00, watch the Disney classic Alice in Wonderland (U) from 1951 on the Big Screen, City Park. Join Alice for her adventures in Wonderland in one of Disney’s greatest animated classics. As the film finishes the Mad Hatter’s come alive as Alice in Wonderland and The Mad Hatter … present the Mad Hatter’s Tea Party! A crazy, fun filled, mad cap show. 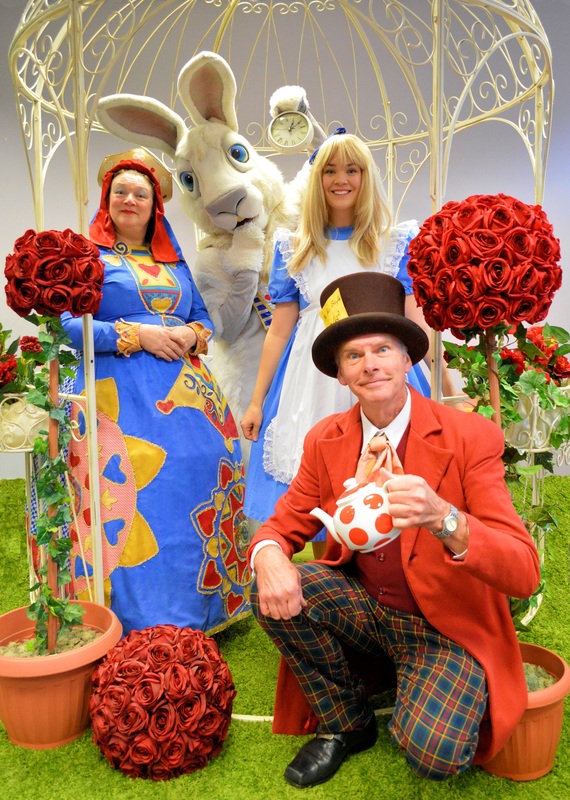 Join Alice and The Mad Hatter in the magical world down the rabbit hole! Can you solve the riddles set by the Mad Hatter? Never mind, neither can Alice! Performances of this short show will be preceded a parade around the mirror pool by the King and Queen and Knave of Hearts together with the White Rabbit. Bring your own picnic if you want and join in the games. Whatever happened to those tarts made by the Queen of Hearts? Who knows – you might even get one! Expect games (flamingo croquet!) and mayhem, and of course lashings of tea! It’s an event not to be missed! Full of audience participation, laughter … and cake, eaten the Mad Hatter’s way!